The UW Tower properties is just 2 block west of Seattle main campus’s north entrance, and a 10 minute walk to central campus. The UW Tower is a secure building. You will need a UW Husky Card to enter. Non-UW visitors will need a government-issued ID to enter and be escorted to our suite upon check-in with the Security Desk personnel. Due to long-term Sound Transit construction on Brooklyn Ave NE these driving directions have changed to lead you one block North to our parking garage on 12th Ave NE. The main entrance for the building is on the corner of NE 45th Street & Brooklyn Ave NE. The UW Tower Properties includes over 700 parking spaces in two adjoining parking structures. For a visual guide to the parking garages, please see the garage floor-plan. UW Parking Services manages and operates the garage as a campus parking lot and normal campus parking rates and policies apply. Personal vehicles must have a UW Parking Permit or pay the standard rate. 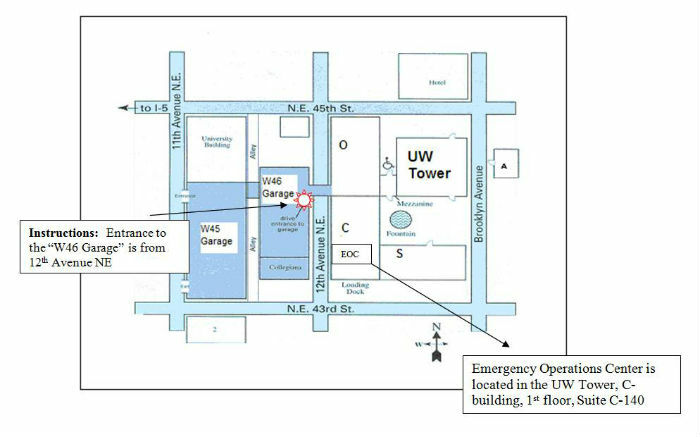 For a visual guide of the UW Tower and parking garage see the garage floor plan. There are multiple metro bus routes operating throughout the day between the UW Tower and campus via NE 45th and either University Way or 15th Ave NE. The Health Sciences Express shuttle provides regular service to UWMC Clinic at 4245 Roosevelt Way NE, approximately 2 blocks SW of the tower properties. Who is “in-charge” of the Department? On a day-to-day basis, the UWEM Director has been appointed and is authorized to perform all the duties and responsibilities assigned based on his/her official job description. However, our department also plans for those times or instances (death, incapacity due to a disaster, travel, etc…) where the Director is unable or unwilling to perform or the position becomes vacant. In those rare cases, our department would enact our internal “Delegation of Authority” procedure by placing temporary authority to other pre-designated individuals to act in his/her absence. A current copy of the UWEM Delegation of Authority memo can be found HERE.